Welcome to Clockmaker, a free match three game. 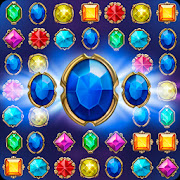 Cascades of three in a row: gems, jewels and puzzles. Find out the Mystery of the Maleficent Clockmaker. Rescue an old town. Embark on a magic puzzle adventure. Play a variety of 3 match games for free offline, online - no Wifi or Internet connection required, no ads. New updates and challenges every month! Great magic gem quests with a story and story characters.